Imagine That! 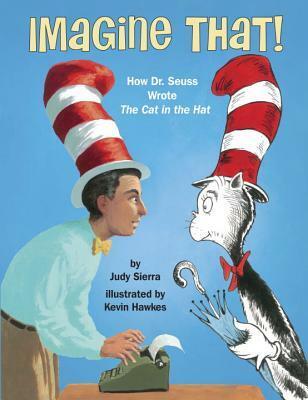 How Dr. Seuss Wrote The Cat in the Hat by Judy Sierra, illustrated by Kevin Hawkes, is a whimsical biography of Dr. Seuss and his creation of The Cat in the Hat, which happens to be one of my favorite books from childhood. The book, which came unbound that promptly became disordered when my daughter pulled it out of the envelope and took a bit for me to get in the right order, has very colorful illustrations of Seuss and his creations. Young readers will learn that Dr. Seuss had already written a number of books before the Cat, and that the Cat was what came of a list of words his friend challenged him to use when creating a first-grade reader book. It’s fun how the mind of Seuss is said to have worked to come up with the Cat and his adventures. My daughter was happy to see the pictures and read some of the words in this one with me. She would prefer a real bound book, she says. Something we’ll have to look into. Until then, we’ll enjoy revisiting the author in Imagine That! How Dr. Seuss Wrote The Cat in the Hat by Judy Sierra, illustrated by Kevin Hawkes. I was born in Washington DC and grew up a few miles away in Falls Church, Virginia. My father was a photographer. When I was little, he took hundreds of photographs of me. ​My mother was a school librarian. She and my father read to me every day, and I learned the words in books by heart long before I could read them myself. Later, they encouraged me to learn longer poems from Alice in Wonderland, Alice Through the Looking Glass, and Old Possum’s Book of Practical Cats. I began writing and illustrating my own books when I was seven. Sometimes I wrote my school reports in rhyme. I also wrote plays and performed them with my friends. Our favorites were tales of Robin Hood, and the Greek myths. These Dreams by Nicole Clarkston for review. Pride and patriotism lend fervor to greed and cruelty, and Fitzwilliam Darcy is caught at the centre of a decades old international feud. Taken far from England, presumed dead by his family, and lost to all he holds dear, only one name remains as his beacon in the darkness: Elizabeth. Georgiana Darcy is now the reluctant, heartbroken heiress to Pemberley, and Colonel Fitzwilliam her bewildered guardian. Vulnerable and unprepared, Georgiana desperately longs for a friend, while Fitzwilliam seeks to protect her from his own family. As the conspiracy around Darcy’s death widens and questions mount, Colonel Fitzwilliam must confront his own past. An impossible dream, long ago sacrificed for duty, may become his only hope. When We Are Married by Caitlin Williams for review. Jane Bennet, bereft and confused, rejected by Charles Bingley is fearful of becoming an old maid. She is eager to fall in love with the very first gentleman who takes notice of her, and Mr Darcy’s is, after all, everything her mother has wanted for her, rich and handsome, the perfect suitor. Pride & Prejudice by Jane Austen, annotated by Sophie Turner for review. The novel needs no introduction. But readers may not have realised that we have been losing “Pride and Prejudice” over the years, particularly digitally. Grammar, spelling, and punctuation have eroded significantly from the 1813 Egerton first edition, and many digital copies suffer from poor formatting. In 2017, the 200th anniversary of Jane Austen’s death, her “darling Child” has been painstakingly restored to the three-volume 1813 first edition. Adjustments have only been made where there were errors in the 1813 text, and are noted in detailed annotations at the end of the novel. Please enjoy this beloved story, restored to Jane Austen’s original voice. Imagine That! How Dr. Seuss Wrote The Cat in the Hat by Judy Sierra, illustrated by Kevin Hawkes, which is for review.